Khagrachhari is a district in south-eastern Bangladesh. 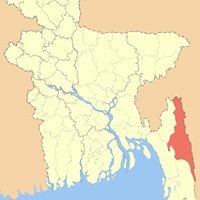 It is a part of the Chittagong Division and the Chittagong Hill Tracts. Its local name is "Chengmi". Khagrachhari is also known as Phalang Htaung (ဖလံေထာင္) or the Mong Circle (of the rest of the three hill districts Rangamati is the Chakma Circle (သက္ေထာင္) and Bandarban (ဗိုလ္မင္းေထာင္) is the Bohmong Circle). Khagrachhari town is the home town of the Mong Chief (currently King, or Raja, Saching Prue Chowdhury ဗိုလ္မင္း သာစိန္ျဖဴ) who is the head of the Arakanese descendants living in the circle. It also is the administrative headquarters of Khagrachhari district. Khagrachhari Local Govt. Council was established on 6 March 1989 to uphold the political, social, cultural, educational and economic right and to expedite the process of socio-economic development of all residents of Khagrachhari Hill District. According to Peace Accord this council was renamed as “Khagrachari Hill District Council (KHDC)” by the Act-10 of 1998. Now this council has been regarded as the main focal point of administration as well as development activities of the district.GeographyKhagrachari is a valley. It has three river namely Chengi, Kasalong and Maini. Chengi is the longest river in Khagrachhari. Most of the areas of Khagrachhari are hilly areas. The main ethnic groups living in the district are Tripuras, Chakmas, Bengalis and Marmas. Manikchari, Khagrachari Hill Tracts "মানিকছড়ি, খাগড়াছড়ি পার্বত্য জেলা"